As a regular power user, I frequently find myself referring to PowerApps, Flow, Power BI websites for the latest release information and documentation around the products. I would love to have this information handy in an app that I can query anytime instead of browsing through websites. In this blog post, I will walk you through the steps to create a simple bot app with PowerApps and the Microsoft QnA Maker. In future posts, we will look at other smart services to use with PowerApps. Let’s explore each of these steps in detail. You can build a bot using one of the several ways outlined in https://dev.botframework.com. 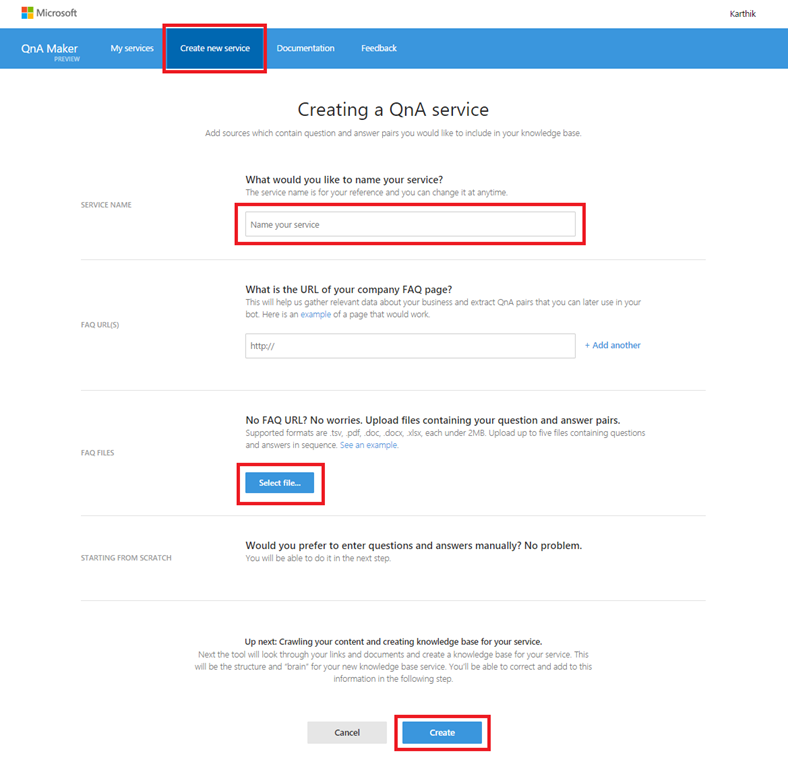 In this example, we will build a bot using the QnAMaker service. Upload a file or point to a FAQ URL to train the bot. I created an Excel file with questions and answers as the starting point that I tweaked later. The content to the file was sourced from the PowerApps documentation site. Within a few seconds, you should see the Knowledge base screen with the question and answer pairs. Add a new pair, edit existing ones or add alternative phrasings to questions. Publish the knowledge base and note down the service details. The service details will be needed in the next step when we create a custom API for PowerApps. 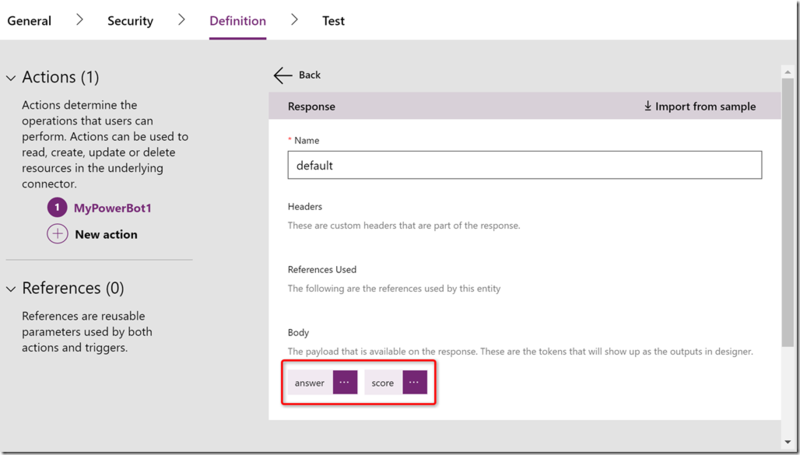 PowerApps provides an easy way to create a custom API to any RESTful service using a UI wizard in the PowerApps portal. Let’s create a custom connector the Bot service. First, test the connection to the bot service using Postman. Save the result in a collection and export the content as a json file. 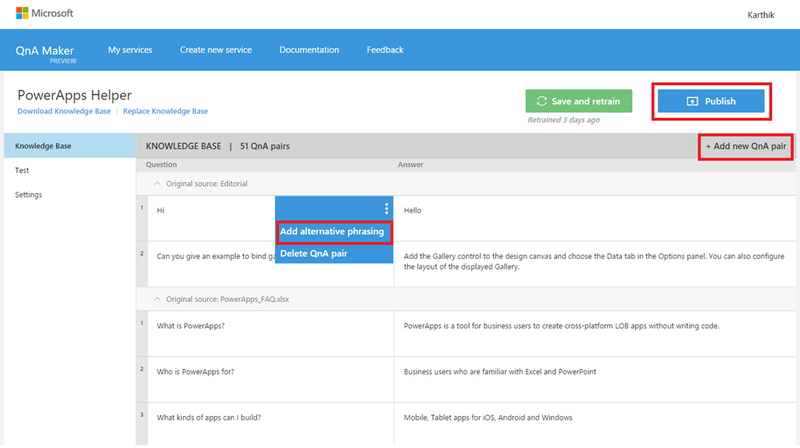 Refer to the PowerApps documentation or the Postman documentation to for the detailed steps. In the Definition tab, edit the General Section to update the Summary, Description and OperationID if required. Edit the Request section and remove Ocp-Apim-Subscription-Key if it exists. This was already added in the previous step. Edit the Content-Type in the Request header and marked the Is Required as No. Edit the Response section by clicking the default. Click on Import from sample. Paste the response from the Postman query as below into the Body field. Click on Create Connector. Once the connector has been created, choose the Test tab. Go back to Manage custom connectors and click Edit on the connector you created earlier. We can now test this custom connection. 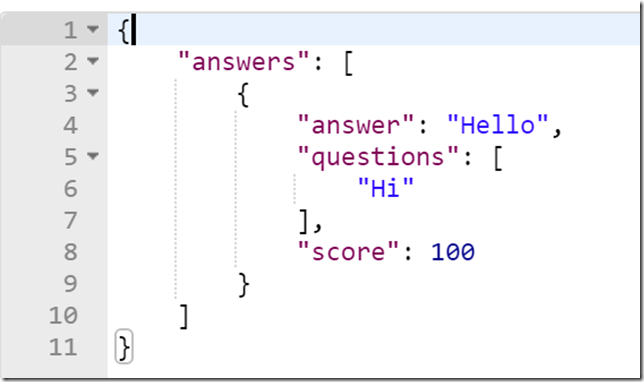 Navigate to the Test tab and under Operations enter a query string. You should see a response from the QnAMaker service. Now we have the custom API to the bot service ready and we can use it to build our app. You can download the swagger definition of the custom API for reference. Replace the paths with your URL below. Let’s create a mobile app that can query the custom API. We will use a Gallery to display the query and results from the interactions. Launch PowerApps Studio on web or on Windows. Make sure the Studio is connected to the same environment where the custom connection has been deployed earlier. Add a Vertical Gallery from Insert option in ribbon menu. Set the Items property of the Gallery to chat. Set the Title to name field in the Collection and the Subtitle to text field. The Gallery will hold the chat conversations. For Text controls, set the Align property to Left or Right depending on whether the content is from the bot or the user. To adjust the length of the text fields use the same condition to adjust the Width and the X properties of the text controls. Here is how the final app looks like. Publish the app once your changes are done and share the app. Adding a callout to the Gallery chat text to make it look more conversational. 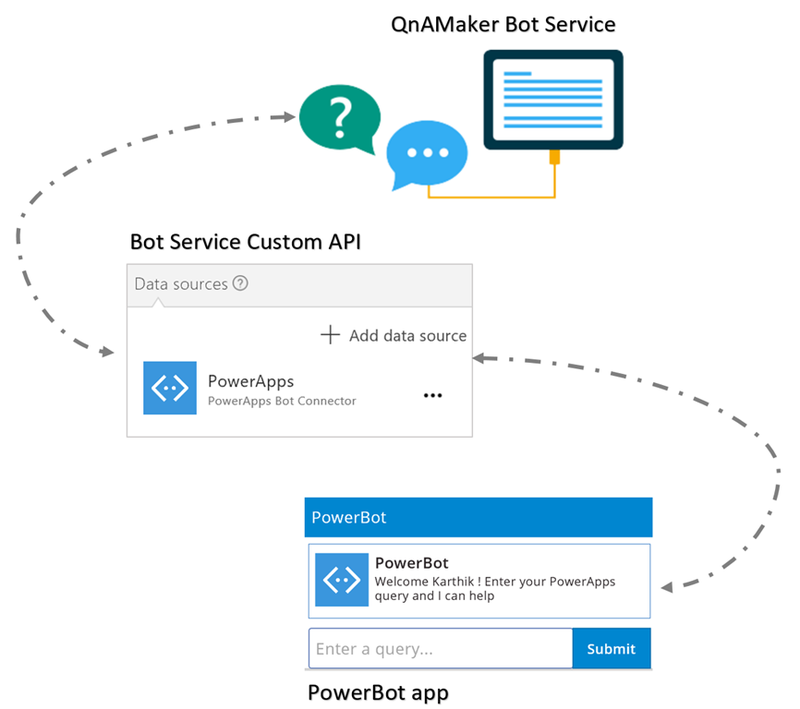 Hopefully this walkthrough gives you the tools to write your own bot using PowerApps. Do let us know your feedback and any interesting bots you are building. Thanks for reading and enjoy building your apps!